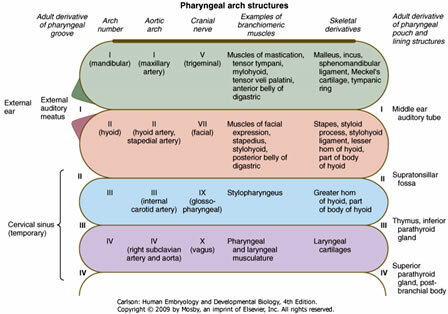 the 1st pharyngeal arch appears at about the beginning of the 4th week and others are added more caudally later such that there are ultimately 5 arches by the end of the 4th week; the 5th arch fails to form, so the arches are numbered 1, 2, 3, 4, and 6.
the entire apparatus consists of paired pharyngeal arches, pharyngeal pouches, pharyngeal clefts (or grooves), and pharyngeal membranes (see diagram). 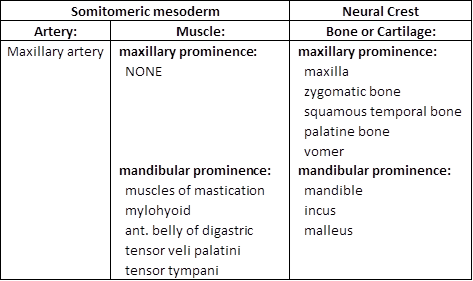 neural crest mesenchyme develops into bone, cartilage, and/or connective tissue in each arch. 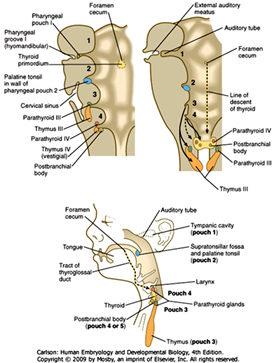 the inside of the pharyngeal apparatus is lined by endoderm that forms infoldings or pouches between the arches; since there are 5 pharyngeal arches, there are 4 pharyngeal pouches, the fates of which are discussed below. 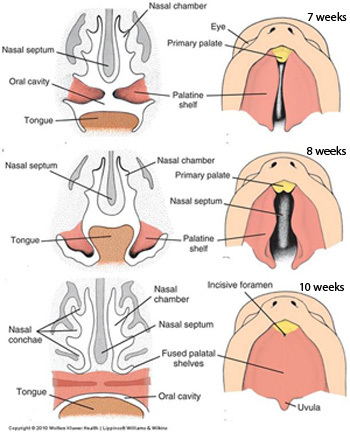 the outside of the pharyngeal apparatus is covered by ectodermal that forms outer pharyngeal clefts (or grooves); as with the pouches, there are initially 4 pharyngeal clefts, the fates of which are discussed below. The pharyngeal clefts are ectodermal-lined recesses that appear on the OUTSIDE of the pharnyx between the arches; cleft 1 is between arch 1 and 2, cleft 2 is between arches 2 and 3, etc. 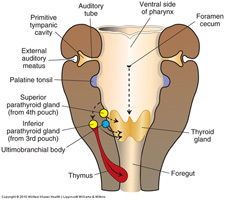 1. pharyngeal cleft 1: develops into the external auditory meatus (the corresponding 1st pharyngeal pouch develops into the auditory (or Eustacian) tube, and the intervening membrane develops into the tympanic membrane). Defects in the development of pharyngeal cleft 1 can result in preauricular (i.e. in front of the pinna of the ear) cysts and/or fistulas. 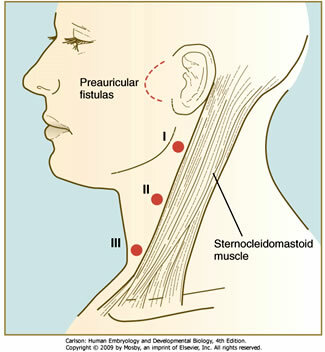 Remnants of pharyngeal clefts 2-4 can appear in the form of cervical cysts or fistulas found along the anterior border of the sternocleidomastoid muscle. 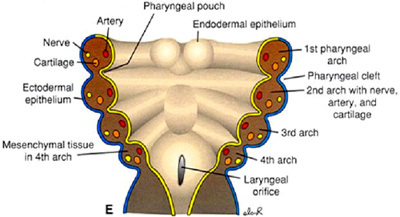 The pharyngeal pouches are endodermal-lined pockets that form on the INSIDE of the pharynx between the arches; pouch 1 forms between arch 1 and arch 2, pouch 2 forms between arch 2 and arch 3, etc. 2. 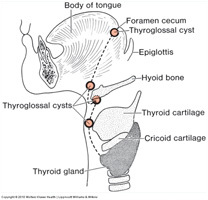 Pharyngeal Pouch 2 –forms numerous infoldings that become the crypts of the palatine tonsil; later, lymphocytes (from the thymus and bone marrow) infiltrate the underlying lamina propria to establish the definitive palatine tonsil. ventral portion of pouch 3: forms the thymus –the epithelial reticular cells (including those that comprise the thymic or Hassall's corpuscles) are derived from the endodermal lining of the pouch. T-cell progenitors from the bone marrow infiltrate the cortex to establish the definitive thymus. ventral portion of pouch 4: forms a diverticulum called the ultimobranchial body, the cells of which migrate into the thyroid gland and differentiate into parafollicular (C) cells of the thyroid gland. 1. Formation: the anterior 2/3 of the tongue is derived from median and lateral tongue buds that arise from the floor of the 1st pharyngeal arch and then grow rostrally. The tongue buds are then invaded by occipital myoblasts that form the intrinsic muscles of the tongue. 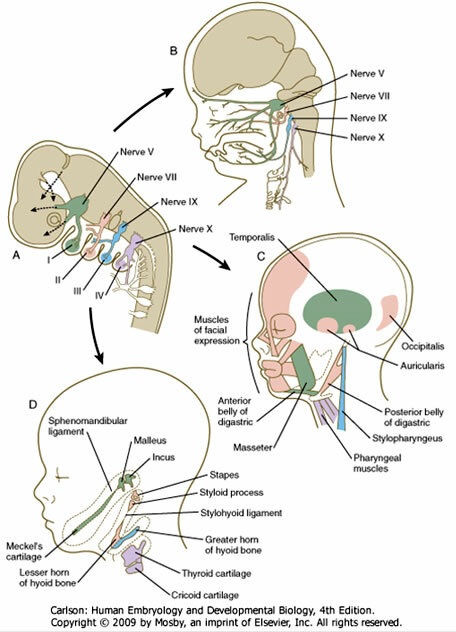 taste innervation is via the chorda tympani branch of the facial nerve, except for the taste buds in any circumvallate papilla that may be present in the posteriormost part of the anterior 2/3 of the tongue –these are innervated by the glossopharyngeal nerve. 1. Formation: swellings from the floor of the 3rd and 4th pharyngeal arches overgrow the 2nd arch and fuse with the anterior 2/3 of the tongue. Thus, the posterior 1/3 of the tongue is derived from the 3rd and 4th arches and there is NO contribution of the 2nd pharyngeal arch in the adult tongue. Intrinsic musculature is also derived from occipital myoblasts. The line of fusion of the anterior 2/3 and posterior 1/3 of the tongue is indicated by the terminal sulcus. arises from a midline thyroid diverticulum that forms from the endoderm in the floor of the pharynx just caudal to the 1st pharyngeal arch; these endoderm cells differentiate into the follicular cells of the thyroid gland. endodermal cells of the ultimobranchial body migrate into the gland and give rise to the parafollicular cells (aka C-cells) of the thyroid. 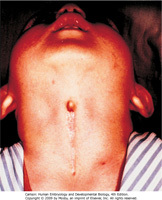 with differential growth of the embryo, the diverticulum elongates, but remains connected to the forming tongue by a thyroglossal duct that later is obliterated; the site of the opening of the thyroglossal duct is the foramen cecum found in the midline at the terminal sulcus of the tongue. 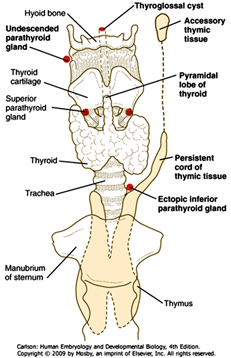 Anomalies in thyroid development can result in ectopic thyroid tissue and/or cysts present along the course of the thyroglossal duct, which is a midline structure (as opposed to cervical cysts, which are remnants of pharyngeal clefts 2-4 and are found lateral to the sternocleidomastoid muscles). flat bones of the cranial vault, aka the "neurocranium" (e.g. parietal and posterior occipital), are derived from paraxial (somitic) mesoderm that develops into bone via membranous ossification. 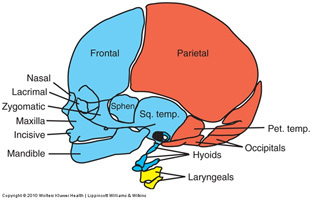 the hyoid bone is derived from neural crest associated with pharyngeal arches II and III. the laryngeal cartilages are derived from neural crest associated with pharyngeal arches IV and VI. 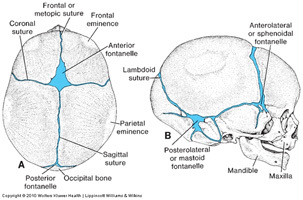 the confluence of the sagittal, coronal, and frontal sutures at the top, front of the skull marks the site of the anterior fontanelle, which typically closes by 1.5-2 years postnatally. Because the brain continues to grow in size up until 6-7 years of age, premature fusion of the sutures or fontanelles will result in abnormal shaping of the head as the brain will cause displacement of the bones that remain unfused. The maxillary prominences (shown in orange below) grow toward the midline and fuse with the lateral nasal prominences (blue). A deep groove called the nasolacrimal groove forms between the maxillary and lateral nasal prominences on either side of the developing nose. Most of the groove is obliterated with fusion of the maxillary and lateral nasal prominences, but a small portion persists as the nasolacrimal duct and lacrimal sac. Inward growth of the maxillary prominences also causes them to fuse with the medial nasal prominences (yellow). Continued growth of the maxillary prominences combined with regression of the frontonasal prominence pushes the two medial nasal prominences together such the medial prominences eventually fuse to form the midline of the nose and philtrum of the upper lip –the superior portion of the frontonasal prominence grows and extends to form the forehead whereas the inferior portion does not grow very much, thus allowing the medial nasal processes to fuse in the midline. initially, the palatine shelves project on either side of the tongue. With growth and expansion of the mandible the tongue moves down, allowing the palatine shelves to grow toward the midline and fuse to form the secondary palate, which consists of the palatine segment of the maxilla and palatine bone. Disruption of growth of the tongue and/or mandible can therefore secondarily cause a cleft secondary palate. Complete fusion of the primary and secondary palate is a complex process involving growth of the component tissues, epithelial to mesenchymal transformation, cell migration, and programmed cell death at fusion sites –disruption of any part of this process can result in cleft palate. Given the involvement of the maxillary and nasal prominences, cleft palate is often (but NOT always) accompanied by cleft lip. 1. 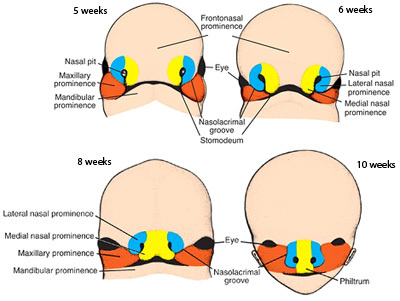 In craniofacial development, paraxial mesoderm contributes to which of the following? 2. 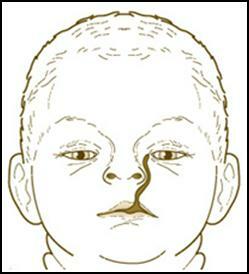 The craniofacial defect illustrated in the figure below was most likely caused by which of the following? A. failure of the medial and lateral nasal processes to fuse with the maxillary process. B. incomplete merging of the maxillary and mandibular processes. C. incomplete fusion of the medial nasal processes. D. overgrowth of the frontonasal process. E. incomplete growth of the mandibular process. C. ventral portion of the 3rd pharyngeal pouch. D. dorsal portion of the 4th pharyngeal pouch. E. foramen cecum at the base of the tongue. 5. Which of the following clinical findings is observed more frequently in association with DiGeorge syndrome but not usually in Treacher Collins syndrome? C. pharyngeal and/or palatal abnormalities. 6. Chromosomal analysis of a patient with DiGeorge syndrome would likely show which of the following? Questions 7-10 refer to the list below. Select the most appropriate structure in the list for each of the following statements or descriptions (each labeled structure may be used once, more than once, in combination with other structures, or not at all). If a statement or description refers to a structure NOT in the list then the correct answer would be "NONE of the above." Questions 11-14 refer to the diagram below. Select the most appropriate structure in the list for each of the following statements or descriptions (each labeled structure may be used once, more than once, in combination with other structures, or not at all). If a statement or description refers to a structure NOT in the list then the correct answer would be "NONE of the above." Questions 15-17 are based on the image below showing an 8-year old female and her 6-year old brother. 15. 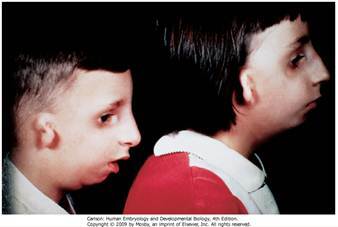 Based on the appearance of these two siblings, which pharyngeal arch appears to be most affected? 16. 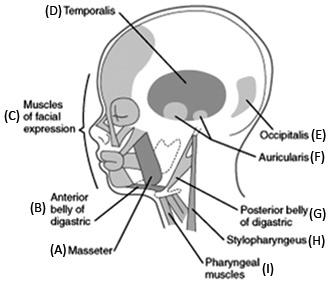 Craniofacial syndromes often affect more than one pharyngeal arch. Which of the following clinical findings would indicate the involvement of pharyngeal arch 2 in this particular case? 17. Which of the following could you expect to find upon further examination?